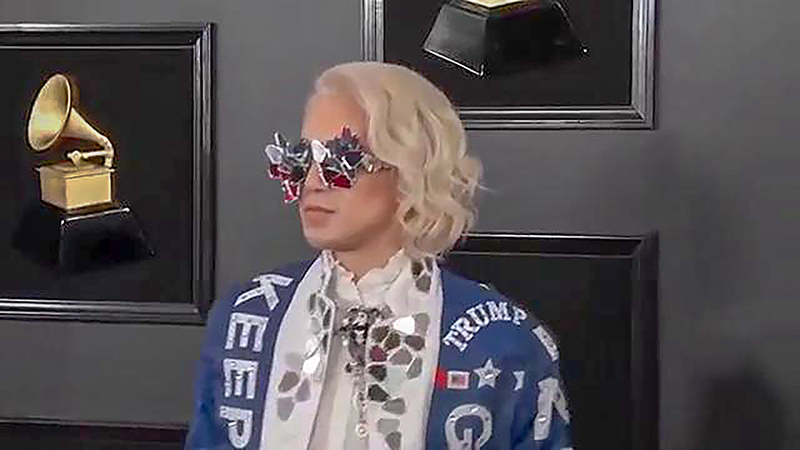 Singer Joy Villa made a serious political statement at the Grammy Awards Sunday evening, walking the red carpet in a custom "build the wall" ballgown. "As she has now added "#MAGA dress wearer on @foxnews" to her Twitter bio, one can't help but feel the dress may have been a publicity stunt. "I 100% support the wall & our President @realDonaldTrump". At last years Grammy Awards she also wore a white dress with a hand-painted baby inside of a rainbow uterus on it along with a purse bearing the slogan, "Choose Life". "I do not apologize for voting for who I wanted to vote for". Seemingly inspired by Donald Trump's plan to build a wall against the US-Mexico border, the musician wore a white dress that featured a brick print. Villa at the 2018 Grammys. In it, he said he's pro-Trump because he supports his refugee ban, and said it doesn't mean he's against the LGBT community. The consequent publicity resulted in her album I Make the Static reaching number 1 among digital downloads on Amazon and iTunes in the US. She elaborated on her viewpoint, saying that about a third of women "who are trying to come to this country illegally are sexually assaulted". I approach it as a show.